On Saturday (July 12), the Premier and Minister of National Security, the Hon. Michael Dunkley, JP, MP, joined the Minister of Tourism Development and Transport the Hon. Shawn Crockwell, JP, MP, and the Minister of Home Affairs Sen. the Hon. Michael Fahy JP, for an informal groundbreaking at the Pink Beach Club. The modest event signals the formal start of redevelopment works at the hotel site, which is being developed by Sardis Developments Ltd. Also present at the groundbreaking on Saturday was Sardis Development Ltd. representative, Mr. Stephen King. Currently there are demolition works already taking place at the site. And it is anticipated that full construction works on the site will start immediately on the planned 34-room boutique hotel. As a particular note, this project is one of the first projects that will benefit from the construction tax relief which was announced by the Premier in May. Today Premier said, “We were thrilled to signal the development of the Pink Beach site with Saturday’s groundbreaking. It is an indication to the people of Bermuda that tangible work is underway regarding hotel development. “I’m pleased to also highlight that our construction relief initiative came into effect on July 1st, and the Pink Beach redevelopment is one of the projects that will benefit from this initiative, and this will translate into jobs for Bermudians. Minister Crockwell added, “From a tourism standpoint, we are very encouraged to see some movement with this property. 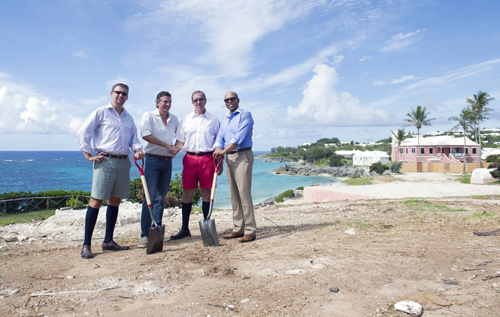 There are genuine strides being made with hotel development in Bermuda and Pink Beach is proof positive of that.